For an auto brand who thrills immerses its star badge with prestige and luxury, the G-Wagen has spent 37 years being a boisterous outcast for Mercedes-Benz. While the SL-Class thrilled the elite with glamorous open top motoring and the S-Class acted as a premium shuttle for VIPs, the four-wheel drive utility vehicle has engaged in some serious, dirty work. Its truck-like ladder-frame chassis and three lockable differentials opened-up radical roads for the German brand to lay tracks in civilian and military roles. Variations of the militarized Mercedes-Benz G-Wagen have been adopted by several nations. Armed forces for Germany, Australia, Canada and even the United States are among a long list of operators of the Mercedes-Benz utility vehicle. Though the Sprinter, Metris and various heavy trucks in Europe live a similar rugged life as the G-Wagen, the vehicle’s utility impression can also be matched by attractiveness as a luxury product. Installed with all the conveniences of a COMAND infotainment solution, Parktronic and a 621-horsepower G65 AMG models in recent years, some in the United States might have not been familiar with how beastly the G-Wagen could be. For 2017, Mercedes-Benz is prepared to give American buyers the means to experience full off-road ferociousness with the G550 4×4. Derived from a 2015 G500 4×4 show vehicle showcasing toughness of the limited-released Mercedes-Benz G63 AMG 6×6, the 2017 model year reality will be equipped with a near-equal amount of extreme off-roading purposes. The Mercedes-Benz G550 4×4 is based on the 4.0-liter Biturbo V-8 powered G550 but stands apart instantly thanks to a considerably taller and wider presence. 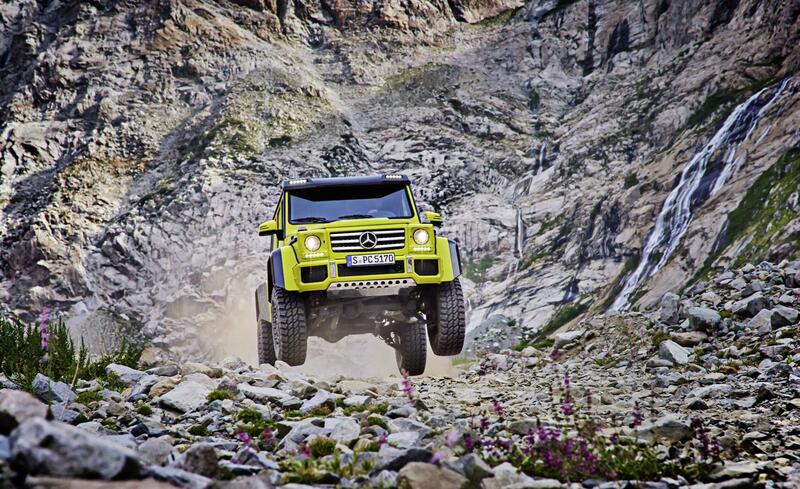 Boasting 88 inches in total height, the Mercedes-Benz G550 4×4 is 11.1 inches higher. The majority of that increased height is attributed to the added ground clearance made possible with a specialized off-road suspension, portal axles and large diameter tires. An advanced suspension system features dual spring and damper struts to handle various terrains for maximized surface contact. Mercedes-Benz has not yet gone into details regarding the wheel/tire combination offered on the G550 4×4. On the 2015 show vehicle, two sets of wheels and tires were proposed with the 4×4 model. One set is based on 22-inch wheels mounted to 325/55 R tires was advertised as standard while an optional 37-inch MT tires was pitched for serious off-road handling. At 17.2 inches (7.9 inches higher than the conventional G550), the G550 4×4’s additional space above the ground allows for drastically improved off-road performance. A maximum approach angle for the Mercedes-Benz G550 4×4 is rated at 51.6 inches while a maximum departure angle is 43.8 inches (actually besting the Hummer H1). Influenced by 416 horsepower and 450 pound-feet of torque, the Mercedes-Benz G550 4×4 is channelled through a 7-speed automatic transmission. Similar to the G550 and the AMG versions of the G-Class sport utility vehicle, 2017 Mercedes-Benz G550 4×4 operates with a permanent all-wheel drive system that works in association with three 100-percent locking differentials. The portal axles used on the G550 4×4 not only elevates the vehicle but accomplishes the feat without changing steering components or drive shafts. Portal axles also provide operators of the Mercedes-Benz G550 4×4 the flexibility of adopting different sized tires without the need to reconfigure the vehicle’s speedometer. Pricing details of the 2017 Mercedes-Benz G550 4×4 have not been revealed to this day. As an estimate, the vehicle should not exceed the $119,900 price of the conventional G550 but should not be greater the G65 AMG. Arriving in early 2017, the G550 4×4 will include the interior luxuries Mercedes-Benz buyers have grown to expect, complete with a standard eight-inch COMAND infotainment system. Are you a Mercedes Benz fan? Check out some of the coolest custom and classic ones HERE.